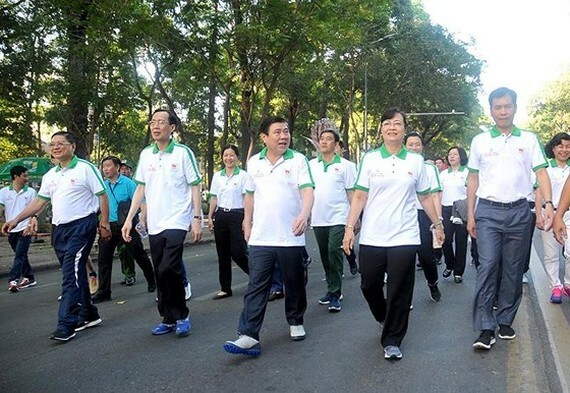 The People’s Committee of Ho Chi Minh City yesterday launched the 2019 Olympic Run Day for Public Health in 23 districts with a participation of more than 20,000 citizens. At this time, the event simultaneously took place at nationwide provinces and cities. In the early morning, the Party leaders, authorities, staffs, armed forces, students, pupils, youth, teenagers, workers, elderly people and citizens gathered in Le Duan Street, District 1 in order to join the activity. 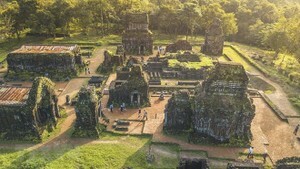 The run day aimed to mark the 73rd establishment of the Vietnam Sports Industry and the day of President Ho Chi Minh’s call on the community to practice physical exercise (March 27, 1946 – 2019). Besides, 2019 is the year of various activities to mark the 50 years of the implementation of President Ho Chi Minh's Testament (1969-2019). The Mekong delta province of Dong Thap also launched annual Olympic Run Day for Public Health on March 25 at Van Mieu Park. Speaking at the ceremony, Deputy Chairman of Dong Thap People’s Committee Doan Tan Buu said that with Olympic spirit " Faster, higher, stronger for the community health”, the annual run has become practical training activities for people with the participation of all walks of people, encouraging the community to do physical exercises like Uncle Ho’s example. He expected after the launch, people should do regularly physical exercise because keeping healthy is citizen’s responsibility for the country’s growth. Province leaders, youth communist members, laborers and students ran 800 meter in the park to Buu Dien intersection and came back while military soldiers and police officers ran 2.2 kilometer after the launch.